This Kingwood backyard kitchen is a perfect example of our work with backyard kitchens. We build all of our kitchens to reflect the individuality of our customer. All kitchens are built for the highest possible quality while maintaining the best price in all of Houston. 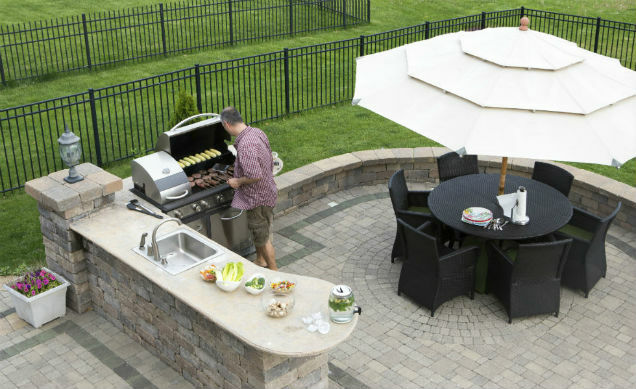 Here at Houston Outdoor Kitchen Pros, we use only the finest and high quality products in our backyard kitchens. Our backyard kitchens are always custom built with 100% customer satisfaction guarantee. This backyard kitchen was made with a blend of lighter grays and white with a small touch of light black, which is one of our favorite color combinations. We use only the absolute highest quality materials in all of our backyard kitchens. As you can see, the owner of this backyard kitchen also enjoyed it! For a great price, you too can own an amazing backyard kitchen like this Kingwood homeowner. Call us today for a free consultation!